Effective charitable giving that starts with you. We develop strategic groups of nonprofits working towards solving complex issues, so you can donate towards causes you care about and trust your giving. We carefully select nonprofits with highly impactful projects and low cost overhead so you always know where your money is going. 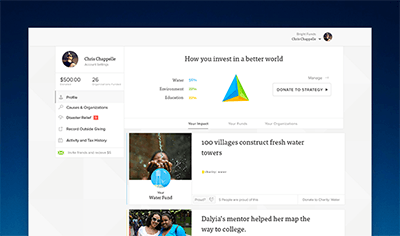 We keep you updated with the activity of your nonprofits so you can be proud of the impact you support. You can design your own fund of nonprofits you know and love so you can still support nonprofits you’ve developed a connection with. 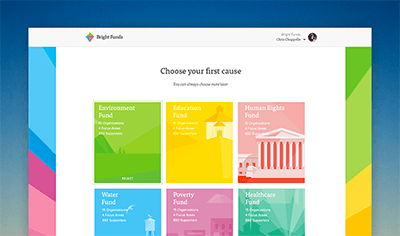 Support causes you are passionate about, give to your favorite nonprofits, keep track of your impact, and take advantage of one-click tax reporting, all from your Bright Funds account. Charitable giving is empowering and a community focused on doing good can make lasting change. We’re here to help you make the impact you want to see in the world, whether that be through causes, your favorite nonprofits, a one-time donation, or a small recurring contribution.